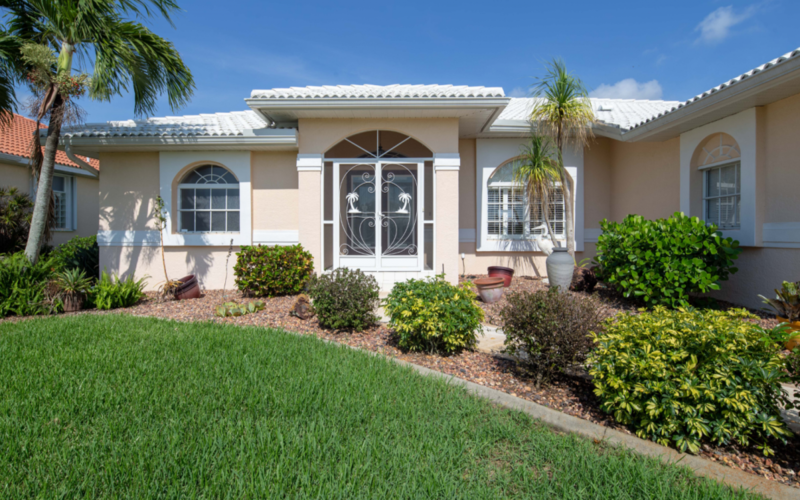 PGI saltwater canal, 3,2,2 home with beautiful mature landscaping, a pool, and spa located on a small culdesac street in Punta Gorda Ilses. Look no further, THIS IS YOUR NEXT HOME! With an open, split floor plan this 1930sf home lives big and bright. Tile floor throughout, plantation shutters or blinds in many rooms, large updated kitchen with stainless steel appliances, beautiful light wood cabinets, dark granite countertops, a lovely dinette area with a view that overlooks the living area both inside and out. The master bedroom has 2 closets, a tray ceiling, sliders to the lanai and plenty of space to enjoy your own private sitting area. The master bathroom offers dual sinks, a walk-in shower, and a soaking tub. The spacious 2nd and 3rd bedrooms are located on the other side of the home offering privacy. The living room and dining room are open and bright. The inside laundry room has a laundry sink and cabinets. The washer and dryer convey with the home. There is a dock with a 10K lift. The pool pump was recently replaced, Hot water heater was replaced in 2014, title roof replaced in 2004, a/c replaced in 2017, Microwave was replaced in 2018. Near to I75, Punta Gorda Airport, restaurants, shopping, Fisherman’s Village, downtown Punta Gorda, the Historic neighborhood in Punta Gorda, and various activities the area has to offer. Enjoy life in paradise looking at the water view, lounging in your large heated pool or unwinding in the spa!